See related article, doi: 10.1007/s12350-009-9063-3. Since its inception, radionuclide myocardial perfusion imaging has been criticized for lengthy acquisition times. With single-detector systems a 20-25 minute acquisition was required to obtain adequate counting statistics. With the introduction of dual-headed cameras, acquisition times were cut in half. However, patient comfort and tolerance still remain suboptimal, and the number of patients scanned in a working day is limited to no more than 10-12 per camera. 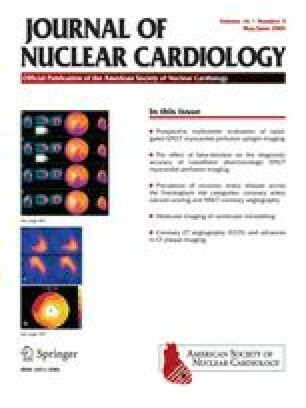 The American Society of Nuclear Cardiology and the Intersocietal Commission for the Accreditation of Nuclear Medicine Laboratories (ICANL) have rightfully insisted that acquisition times not be decreased below those set forth in the ASNC Guidelines in order to maintain adequate image counting statistics, thereby maintaining test sensitivity and minimizing artifacts associated with low count density studies. However, the advantages of shortening image acquisition times even further are considerable. Patient tolerance would be improved, the opportunity for patient motion would be decreased, and laboratory throughput would be enhanced. The Nuclear Cardiology community has responded to this dilemma in two ways. First, new high-speed cameras with novel detector characteristics have been developed. The D-SPECT® camera introduced by Spectrum Dynamics performs a preliminary scan of the chest using a scanning multi-detector system, allowing the detectors to be focused on the heart, thereby improving count rate statistics and allowing a markedly reduced image acquisition time.1 An additional advantage of that system is that cadmium zinc telluride (CZT) semiconductor detectors are substituted for traditional sodium iodide detectors, thereby decreasing the size of the camera head and improving energy resolution. Another novel detector system, the CardiArc®, employs focused, multiple slit-hole collimation to improve resolution and markedly reduce image acquisition time. Prototypes of the CardiArc system employed either traditional sodium iodide detectors or CZT semiconductors. General Electric has recently introduced the 530C camera incorporating CZT detector technology with multi-pinhole focused collimators with or without 64-slice CT imaging and attenuation correction. The advantages of theses new cameras include a smaller camera footprint, markedly reduced image acquisition times, and improved energy resolution with CZT, potentially minimizing SPECT degradation by scattered radioactivity. However, the cost of these new cameras (or any new camera for that matter) has become an increasingly important consideration in the present economic environment. An alternate, less costly approach has been the development of new software methods that allow lower count-density cardiac SPECT acquisitions to be processed with resolution recovery and noise-reduction techniques. The advantages of a smaller camera footprint and improved energy resolution described above for new detector systems are not realized with these novel software methods. However, economically they provide a reasonable alternative solution to the nagging problem of long acquisition times and decreased patient throughput. In the current issue of the Journal, Maddahi et al reported the results of reduced-time myocardial perfusion SPECT using the new Digirad nSPEED® software in a prospective, multicenter trial of 448 patients in whom full-time gated SPECT acquisitions and simulated half-time acquisitions were compared qualitatively and quantitatively with regards to perfusion defect characteristics and functional parameters.2 Their impressive results demonstrated that reduced-time acquisition image quality was at least as good as, and often superior to, that obtained with full-time acquisitions. The two techniques provided diagnostically equivalent images. Quantitative perfusion defect severity was not significantly different, and there was an extremely good correlation between end-diastolic volumes, end-systolic volumes, and ejection fractions measured by the two techniques. The implication, although not specifically stated by the authors, is that this new half-time method can be reliably substituted for full-time SPECT acquisition. Previously, Borges-Neto et al reported similar findings using a standard dual-headed sodium iodide detector system in a single center study of 50 patients employing wide beam reconstruction half-time software developed by UltraSPECT Ltd.3 This processing algorithm incorporates resolution recovery and Poisson and Gaussian noise modeling without post-processing filtering. They reported highly significant correlations between perfusion variables using wide beam reconstruction as compared to full-time filtered back projection processing. Subsequently, using the same half-time acquisition/processing algorithm, DePuey et al demonstrated improved quality of half-time gated perfusion SPECT functional images compared to full-time filtered back projection gated tomograms in 156 patients studied prospectively with separate full-time and half-time acquisitions.4 There was an excellent correlation between volumetric parameters using the half-time vs full-time methods, although ejection fractions were systematically lower with half-time processing, probably due to a more accurate detection of end systolic contours afforded by wide beam reconstruction. In a separate prospective trial of 209 patients, these investigators recently reported excellent correlations between both perfusion and functional parameters using even shorter, “quarter-time” acquisitions (4 seconds per stop post-stress and 6 seconds per stop post-rest with a 90-degree angled dual-headed camera) processed with the wide beam reconstruction technique compared to full-time acquisitions processed with ordered subset expectation maximization (OSEM).5 Although reconstruction artifacts were encountered occasionally in the low count density resting myocardial perfusion SPECT images, in general wide beam reconstruction “quarter-time” image quality was equivalent to or superior to that in full-time OSEM studies. CTCA, CT coronary angiography; ECG-TCM, retrospect electrocardiographic gating with tube current modulation. Radiation exposure (EDE) associated with a diagnostic cardiac catheterization is approximately 11 mrem (reported range 3.1-22.7).9 Therefore, since the radiation dose received from a myocardial perfusion scan is comparable to that from either diagnostic coronary angiography or CT coronary angiography with dose modulation, and even greater than CTCA with diastolic gating, there is presently little advantage of radionuclide myocardial perfusion SPECT with regard to radiation exposure. Consequently, a “full-time” SPECT acquisition with a reduced radiopharmaceutical dose is a very attractive alternative to a decreased acquisition time firstly to decrease patient radiation exposure, and secondly as a means to compete with CT coronary angiography, a technique that has been demonstrated to have greater diagnostic accuracy that myocardial perfusion SPECT in detecting coronary disease, but for which presently there is inadequate data regarding prognostic values or cost effectiveness. Considering these alternatives, with the possibility of either reduced-time or reduced-dose SPECT there is the opportunity to “customize” scan protocols to meet specific patient requirements. For example, in a younger patient in whom radiation exposure is a concern, a reduced radiopharmaceutical dose and “full-time” acquisition may be preferable. In an elderly, arthritic, or uncooperative patient unable to tolerate a 12-15 minute SPECT acquisition, a full radiopharmaceutical dose and reduced-time SPECT acquisition would be beneficial. In an obese patient, in order to increase image counting statistics, as an alternative to “weight-based” (i.e. increased) radiopharmaceutical doses, a standard dose could be given in combination with a “full-time” SPECT acquisition processed with reduced-time software. There are important clinical advantages of higher resolution gated myocardial perfusion SPECT images with an improved signal-to-noise ratio, an advantage that has been demonstrated in phantom experiments and clinical studies for both the new camera systems as well as the new, reduced time software methods. For low count density studies, frequently encountered in obese patients, suppression of noise would render scans more easily interpretable. In patients with known or suspected myocardial infarction, associated regional wall motion abnormalities would be more easily detectable. Likewise, regional abnormalities associated with post-stress stunning, an indicator of severe or extensive coronary disease, would be more easily detectable in post-stress gated tomograms.10 In the distribution of a fixed myocardial perfusion defect abnormal regional wall motion favors myocardial scarring, whereas normal wall motion is more commonly associated with artifact. Improved definition of the endocardial border and identification of regional wall motion abnormalities should make this differentiation easier. Resolution of post-stress regional wall motion abnormalities in gated resting SPECT scans and an improvement in left ventricular ejection fraction from stress to rest favor stress-induced left ventricular dysfunction. Identification of such stress-induced left ventricular dysfunction improves the sensitivity of myocardial perfusion imaging in the detection of coronary artery disease.11,12 However, because resting gated SPECT images are frequently of low count density, particularly in patients undergoing a low-dose rest/high-dose stress single-day Tc99m sestamibi or tetrofosmin protocol, comparison of low count density gated rest tomograms with high count density gated stress tomograms is often challenging. Similarly, since endocardial edge detection algorithms may perform differently in high count density vs low count density, noisy images, quantitative analysis of left ventricular functional parameters may be inconsistent. Improved resting gated image quality should render the visual and quantitative comparison of resting and post-stress gated images more reliable. Additionally, increasing the number of gated frames per cardiac cycle (from 8 to ≥16) offers the possibility of increasing the resolution of the derived left ventricular volume curve, thereby providing both a more accurate ejection fraction and the potential for quantitative analysis of systolic emptying end diastolic filling (i.e. peak systolic emptying rate and peak diastolic filling rate).13 However, because myocardial perfusion SPECT is count rate limited using standard methodology, such an increase in the number of gated frames per cardiac cycle further decreases image quality and decreases the signal-to-noise ratio. Improvement in image quality and the signal-to-noise ratio with either the new camera systems or new software methods affords the possibility of implementing quantitative analysis of ≥16 frame per cardiac cycle gated SPECT, potentially expanding the role of the modality in diagnosing the left ventricular dysfunction. Other potential advantages of shorter acquisition times include the use of Tc99m teboroxime, which is highly extracted by the myocardium but clears very rapidly, necessitating rapid acquisition, and the possibility of performing gated SPECT acquisitions during dobutamine infusion to evaluate functional reserve as well as viability in a manner similar to that which is routinely accomplished with echocardiography. These applications most likely will require SPECT acquisition times even shorter than 5-7 minutes. With even shorter acquisition times it may be possible to evaluate the dynamic phase of myocardial uptake of radiotracers, potentially improving our ability to assess and even quantify global and regional myocardial perfusion. In summary, the new cameras and software methods that have recently become available hold great promise to improve the efficiency, flexibility, safety, and clinical applicability of Nuclear Cardiology and even expand our diagnostic capabilities. Furthermore, in a time of rapidly developing, competing imaging modalities, these attributes serve to reinforce the advantages of Nuclear Cardiology and to allow us to remain a competitive and viable modality.